This is a process of welding stud (a headless threaded bolt) or stud-like pieces (e.g. bolts, screws, rivets, rods, etc.) to flat workpieces like plates. Its a unique process which combines arc and forge welding processes and results in tremendous cost saving when compared to the conventional methods like drilling and tapping. Stud welding was first used by British Navy in 1918 but its regular and extensive use started from 1938. There are four variations of the process viz., capacitor discharge stud welding, the drawn arc capacitor discharge stud welding, the consumable ferrule stud welding and the drawn arc stud welding. The last variation of the process is the most popular and the following description pertains to that only. The main equipment for stud welding consists of a stud welding gun, a time control unit, a dc power source of 300 to 600 amperes current capacity, studs, and ceramic ferrules. A stud is held in the welding gun and a ferrule is slipped on it. The stud is then made to touch the cleaned spot (shot blasted, ground, or wire brushed) where it is to be welded and the switch in the form of gun trigger is pressed and the process is completed in a couple of seconds. 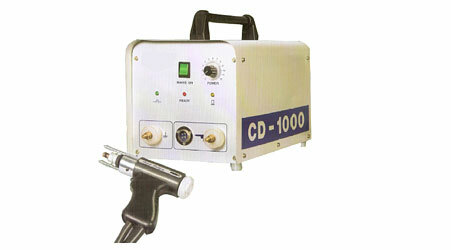 This necessitates the use of ultra-high speed power source to supply the desired welding current. A stud about 40 mm diameter requires about 5000 ampere current at 65 to 70 volts for 2 seconds. Therefore, motor-generator sets with their higher overload capacities are preferred over the rectifier welding sets. For efficient results the plate on which the stud is to be welded must have the minimum thickness at least 20% that of the diameter of the stud, however for developing full strength it should not be less than 50% of the diameter of the stud base. Stud welding is used mainly for mild steel, low alloy steels, and austenitic stainless steels. 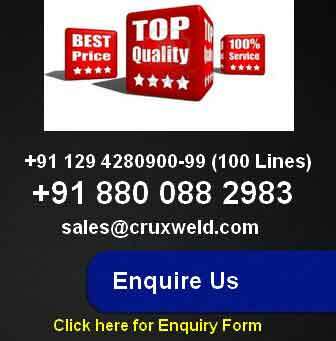 Drawn arc stud welding is not used for non-ferrous metals but other variants of the process can be utilized for welding lead free brass, bronze, chrome plated metals and aluminum. However heat-treatable aluminum alloys are not recommended for stud welding. Typical applications of stud welding include steel decks of ships, for attaching brackets, hangers, cover plates, conduits, piping, etc. to metal workpieces. The process also finds wide use in automotive rail road machinery manufacturing and construction industries.